You don't need to be a neat freak to hate having wires snaking all over your desk, especially if you're a laptop user who wants to get up and go without first untangling a rat's nest of cables. It's bad enough that you have to unplug your monitor and power supply. These days, there's no good reason to mess around with a wired mouse and keyboard (unless, of course, you're a gamer worried about lag). I've spent the past several weeks auditioning a brand-new mouse and three all-new keyboards that let you cut the cord so that you can be more comfortable and productive in front of your PC. Stop digging batteries out of random remotes just to get your wireless keyboard back to working order, and go green in the process. Batteries, even the rechargeable ones, are a pain because they fail at the most inopportune moments. 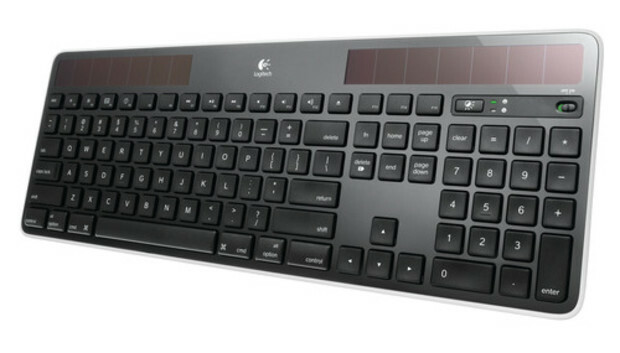 Logitech's K750 Solar Wireless Keyboard depends solely on light--any light--for power. Dominating the top of this plank are two wide photo-voltaic panels that convert any type of light to electricity. Whether you're positioned next to a window or tucked away in the bowels of your building's basement, all this keyboard needs is a little ambient light from your desk lamp or ceiling lamp (or the sun, of course) to power itself and charge its internal battery. With its battery charged, you can work in complete darkness for up to three months, according to Logitech. We'll have to take the company's word for it--I love my job, but I wasn't about to test that claim. Pushing a small button above the numeric keypad lights an LED next to a happy-face icon if the keyboard has enough power, or a sad-face icon if it doesn't. You can also install an app on your PC that displays the keyboard's battery status and indicates just how much light energy it's collecting at any point in time. Although Logitech chose to accommodate the solar panel by slightly reducing the size of the keys rather than increasing the overall size of the keyboard, the keys don't feel cramped. My fingers had enough space to stretch out and type accurately at a decent speed. The K750 relies on Logitech's tiny wireless (2.4GHz) Unifying receiver, which can also pair with up to six other Logitech devices at the same time. The top-row F-keys have alternate functions, such as opening your Web browser's home page, calling up your email application, launching your PC's calculator, controlling your media-player software, and putting your computer to sleep. The keyboard is only a third of an inch thick and lies very flat even when you use the included tabs to angle it upward. It doesn't offer much of a well for the keys to travel into, so keystrokes are short, but they deliver a satisfyingly solid feel when they bottom out, providing surprisingly good tactile feedback. If you have sensitive ears, you might find the K750's plastic-on-plastic clicking to be annoying after a while. The K750 Wireless Solar Keyboard is available now for $60. If you're a fan of Windows 8 gestures, but not prepared to upgrade to a pricey touchscreen display to make use of them, give Logitech's TK820 all-in-one wireless keyboard a look. It has a large embedded touchpad right where the numeric keypad would be on a conventional keyboard. Of course, if you're fond of numeric keypads, you won't be thrilled with this design. The TK820 is thin, light, very attractive, and easy to fit into a backpack should you decide to take it with you. But unlike most keyboards, it lies perfectly flat on your desktop, with no flip-out feet to adjust its typing angle. The omission is sure to make this keyboard a nonstarter for a whole group of folks--and that's unfortunate, because the TK820 is a very good keyboard otherwise. Its keys are quiet, firm, and responsive, and it has a nifty collection of buttons dedicated to various Windows 8 functions. The large, smooth touchpad recognizes Windows 8 multitouch gestures, but its high sensitivity and close proximity to my right hand had me unintentionally clicking and repeatedly sending my cursor flying across the screen. The TK820 Wireless All-in-One Keyboard relies on the same Unify wireless receiver that Logitech's other peripherals use. Logitech says you can expect its battery to last around six months. The keyboard will be available sometime this month, but you can preorder one now for $100. Microsoft has been manufacturing ergonomic keyboards for nearly 20 years, having introduced its Natural Keyboard way back in 1994. The company is attempting to make ergonomic computing cool again with the Microsoft Sculpt Ergonomic Desktop set. This three-piece set includes a modern-looking ergonomic keyboard, an oversize angled mouse, and a detached numeric keypad. The keyboard's unusual design is intended to keep your wrists in a more natural position, and it includes a cushioned rest. (Fun fact: The cushion is fabricated from the same material that Surface covers are made of.) If you find the wrist rest to be too low, Microsoft provides a magnetic plastic riser that you can attach to the bottom of the keyboard to elevate it slightly. Once I got past the learning curve, I found the Sculpt's keystrokes to be easy, quick, and almost inaudible. The keyboard sports dedicated keys for Windows 8 tasks, as well as buttons for controlling media-player software (play/pause, mute, and volume). You don't need to worry about holding down some annoying Fn key either, as a simple switch toggles between the F-keys and their alternate functions. Microsoft has moved the numeric keypad off the main keyboard and turned it into a separate device that resembles a calculator. It's there when you need it, and out of your mouse's way when you don't. I really like the concept, though it does add some desk clutter. The pièce de résistance of the set is the large, round mouse that fits into your hand like a well-worn baseball--without the stitching. The device's slant, thumb indentation, and well-placed buttons make for pain-free mousing even after long hours of use. The button inside the thumb indent acts as the Back button, while the Windows button opens the Start menu (or the Start screen, if you're using Windows 8). The four-way scrollwheel provides good tactile feedback when scrolling--nothing mushy here. All three devices connect to your PC using the same 2.4GHz USB dongle, which fits snugly in the bottom of the mouse when you want to hit the road with your laptop. Unlike Logitech's K750 keyboard, Microsoft's peripherals rely on batteries. But Microsoft claims that the keyboard batteries will last three years, the mouse one year, and the keypad a full six years. Microsoft's Sculpt Ergonomic Desktop bundle will be available later this month for $130, or you can buy the keyboard (with number pad) for $81 and the mouse for $60.